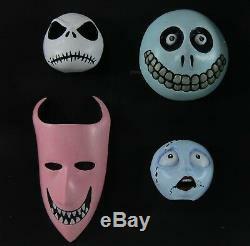 These beautiful Nightmare Before Christmas faces have been cast from the original production made ones. These face's were made by a professional prop maker, who has left the minor imperfections in order to keep to the original. She has also added the eyes to Sally and Barrel to bring these face's to life. These face's are made from resin. Sally's face measures approximately 1.75 across, as does Jack's. Lock stands at approx 4.5 tall. The face's are in great condition. The faces have been framed in a white box with a glass front to make them ready to display! THIS ITEM WILL BE SENT INTERNATIONALY VIA PARCELFORCE PRIORITY. 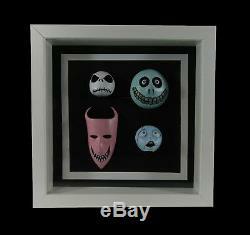 The item "THE NIGHTMARE BEFORE CHRISTMAS (1993) Faces'Cast From The Originals" is in sale since Sunday, October 7, 2018. This item is in the category "DVDs, Films & TV\Film Memorabilia\Props\Original". The seller is "studiopropsuk" and is located in Camborne. This item can be shipped worldwide.